From 1908, William Jennings Bryan describes An Ideal Republic. 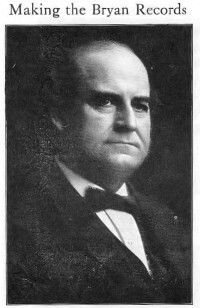 Announcement "An Ideal Republic, by William Jennings Bryan. Edison record." During the 1908 presidential campaign, Edison recorded and sold several speeches by candidates William H. Taft and William Jennings Bryan. Here, Bryan gives his vision of a perfected nation. 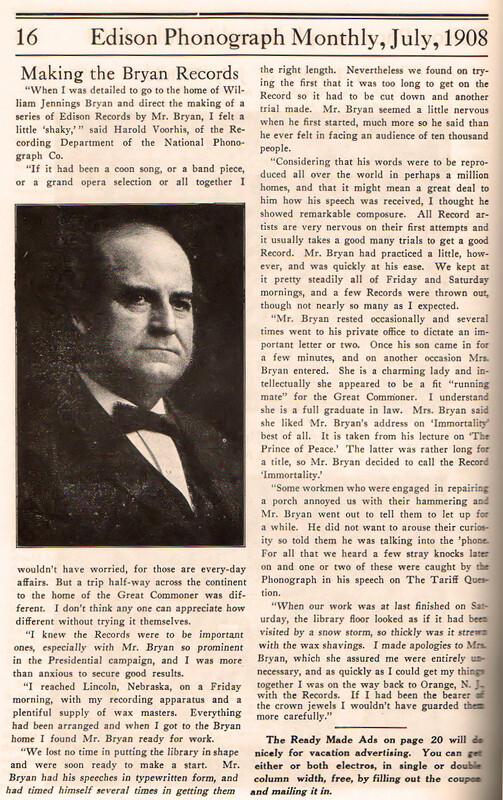 Click on the photo, above, to read an interesting article in the July 1908 Edison Phonograph Monthly on recording the speeches of William Jennings Bryan. Perhaps no American of to-day can equal Mr. Bryan in the difficult dual art of conceiving ideal conditions and finding suitable language for describing them. This Record gives him the same kind of opportunity as his speech on "Immortality," and seldom has he drawn on the wonderful store-house of his imagination with such fine effect. "Behold a Republic," he exclaims, "where every citizen is a sovereign, but none cares to wear a crown; whose flag is love while others' is only fear." His peroration is very fine and concludes with these words, "A Republic, whose history, like the path of the just, is as the shining light that shineth more and more unto the perfect day." Interested in hearing other two-minute wax cylinder recordings by William Jennings Bryan and William H. Taft?